We envision a world without poverty and hunger, and this starts with ensuring that all children attend school to gain the skills they need to get ahead. Progress over the last several decades has shown us that this is possible. Today, fewer people are living in poverty, and more children than ever (girls and boys) are in school. However, millions remain out of school and millions more are just not learning. Yet, new World Bank research shows that education – and the more the better – can boost incomes while a lack of education can cost trillions of dollars, globally. 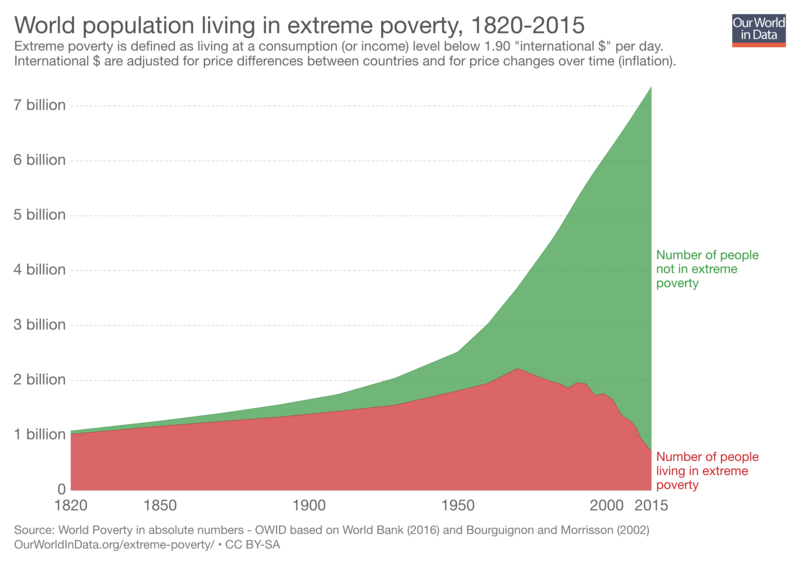 The absolute number of people living in extreme poverty has fallen from over 2 billion in 1970 (the peak of red in the graph below), to 705 million today. This is true despite a burst in population growth. 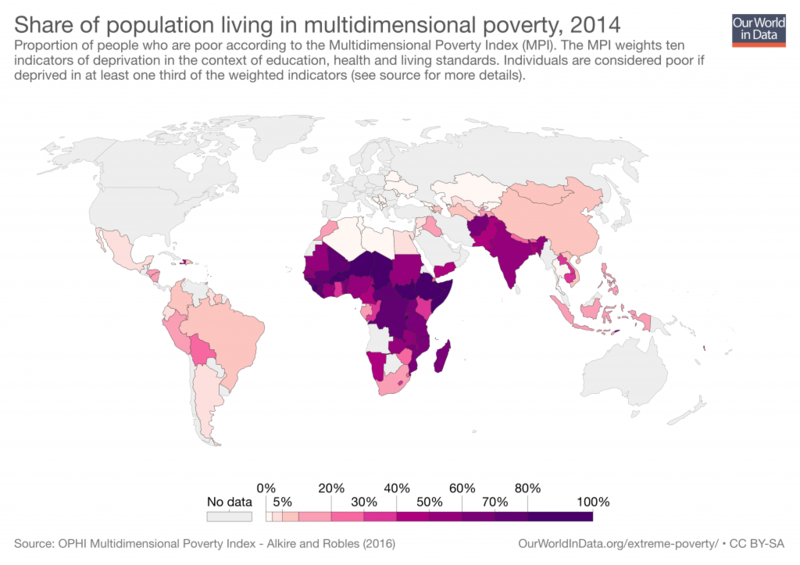 Proportionally, poverty has declined from 44% of the population to around 10% in the same time period. The number of out-of-school primary-aged children across the globe declined from 100 million to 63 million between 2000 and 2017. The number of out-of-school youth of upper-secondary school age fell from 177 million to 139 million in the same period. While recognizing progress, the fact remains that millions of people continue to live in extreme poverty and one in five children and youth is out of school. Moreover, over the last five years, the decline in the out-of-school population has tapered off and remains staggeringly high at 263 million. Further compounding this bad news is the fact that the UNESCO Institute of Statistics (UIS) estimates that six out of ten children are not meeting minimum proficiency standards in mathematics and literacy. That means that 617 million children, two-thirds of whom are in school, are just not learning the skills they need to increase wages, improve their income earning power and climb out of poverty. In low-income countries, where people could benefit the most from poverty-busting tools, almost 90% of school-aged children and youth are not meeting minimum standards in these foundational skillsets. So, not only are millions of children still losing out on getting an education, millions more who are in school just aren’t learning. This learning crisis is more disconcerting when paired with the fact that study after study, as well as years of anecdotal experience, have shown that education is a crucial factor in lifting people out of poverty. We would even go so far as to say that education – quality education ­– is a silver bullet and the best poverty-busting tool available. Research also shows that there is a complex interconnectedness between poverty, education and gender. In fact, the ability of education to improve the lives of women and girls is particularly compelling. Conversely, the cost of not educating girls is massive. This is why at least half of the beneficiaries of the projects the 60 million girls Foundation supports must be girls. Stunning new research shows that each additional year of schooling at the primary level can boost a woman’s income by up to 19%. Secondary education can double a woman’s income and tertiary education can triple it. In addition to wage growth, education can help the poor find more stable employment opportunities in the formal sector. According to the International Labour Organization (ILO), the least educated tend to work almost exclusively in highly informal employment, though this falls to 88% for those with at least a primary-level education and 68% for those who have completed secondary school. And women in low-income countries work in the informal sector at a greater rate than men. Even for some of the most marginalized groups like agricultural workers, education can make a difference. An educated farmer can increase agricultural output by making more informed decisions about adopting new techniques to increase efficiency and productivity, and better adapt to changes brought on by climate change. On the other side of the scale, a new World Bank report reveals that the economic cost of not educating girls and women through secondary school runs from US$ 15-30 trillion based on lost earnings. Poverty, though, encompasses more than dollars and cents. It is multidimensional and includes other elements of well-being, such as education, a lack of nutrition, health, housing and a willingness to stand up for one’s rights. Poor access to education may be a consequence of poverty, but it also part of the solution. Educated women are more likely to delay childbirth and, when they do start a family, they are able to make better decisions in regards to nutrition and are more likely to get their children vaccinated. Girls who are more educated are also less likely to get HIV/AIDS. More education also gives women a greater say in when and whom they marry. Child marriage can trap girls in negative, unhealthy relationships and it perpetuates poverty as young brides, still children themselves, become young mothers. Further, an educated woman is also more likely to ensure that her own children, girls and boys, go to school, thus breaking the cycle of intergenerational poverty. So, what is the solution to the large numbers of out-of-school children and poor learning outcomes? Who is out of school? Where do out-of-school children and adolescents live? What are the particular barriers facing children in that community? Is there a secondary school within reach of all children graduating from primary school? If not, why not? What are the learning outcomes in different communities? Without answers to these questions (and many more), it is difficult to design impactful policy that will reach those most in need. We believe that together, by focusing on education, especially for the most marginalized groups, we can make the world a better place with more opportunities for everyone. To see our posts and to learn about what we do, please follow us on Twitter, Facebook and LinkedIn.